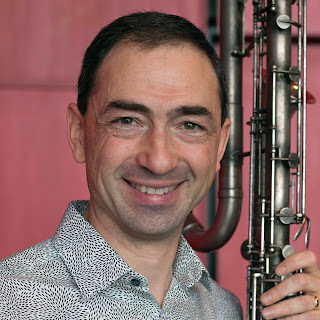 Jean-François Charles is a composer, clarinetist, and live electronics designer. He started composing and performing the Electroclarinet series in 2009; he has performed these works in China, France, Finland, and the United States. He studied at the Strasbourg Conservatory with the Italian composer Ivan Fedele. He earned his Ph.D. in music/composition at Harvard, where he studied with Hans Tutschku, Chaya Czernowin, Julian Anderson, Michael Gandolfi, Helmut Lachenmann, and Gunther Schuller. His article A Tutorial on Spectral Sound Processing using Max/MSP and Jitter published in the Computer Music Journal has helped many electronic musicians integrate spectral sound processing into live performances, compositions, or their own software creations. As a clarinetist, he studied with Armand Angster; he worked with Karlheinz Stockhausen for the world première and recording of Rechter Augenbrauentanz (Stockhausen-Verlag CD #59). Aqua ignis for double bass and chemical apparatus, première by Volkan Orhon, Dan Moore and Benjamin Revis in Iowa City, April 8, 2018. Absalon Crash for cymbal and live electronics; première by Jean-François Charles at Virginia Tech, June 3, 2018. Gentiana for trumpet, percussion, guitar, violin, violoncello, and electronics; première by the Nebula Ensemble in Denver, June 20, 2018. Nattie’s Air for mezzo-soprano, bass clarinet and resonant cymbal; première by Ensemble Accroche Note in Strasbourg, France, June 28, 2018.